PRICE: Offers above US $1,000,000. PREFERRED BUYER: To the highest bidder. CONDITIONS OF SALE: If displayed publically, the painting must be removed from 25 December to 7 January. STORY: This, for AbFab relatively large painting speaks about the modern transformation of Christmas in all Christian cultures, from a religious holiday into a big shopping excuse. 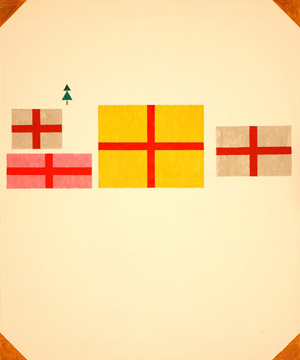 Two green triangles and one brown rectangle are an AbFab way to suggest a Christmas tree, which is extremely small on this canvas, thus suggesting the diminutive nature of the religious aspect of this yearly event. Large rectangles with crosses underneath the tree suggest extremely large presents, emphasizing its consumerism side. Vast expanses of the canvas are white, which both resembles snow during Christmas in the Northern Hemisphere and suggests a spiritual emptiness of the whole experience. The latter is emphasized by four brown triangles in the corners, which look like the old fashion mounting corners for photographs. Consumerism of Christmas is further emphasized by the lack of preferred buyer, while conditions of sale stipulate that the painting must be removed from public display between 25 December and 7 January; the latter because Ethiopia, Russia, Ukraine, Serbia, the Republic of Macedonia, and the Republic of Moldova celebrate Christmas on what in the Gregorian calendar is 7 January. This painting is homage to the work and teaching of Paul Klee in more than one ways. He was interested in similarities and differences between how children and modern artists (especially abstract artists) represent trees, and in general in the ability of children to perform adult-like creative activities. AbFab offers yet another way to paint a tree, even though violating in this process one of its basic rules, arguing that paintings of Paul Klee were abstract in their nature even when they contained representations of objects. AbFab is interested in child-like behavior of adults and its frivolity. Paul Klee predominantly created small works (sometimes very small), and Religious Holiday is one of the largest paintings made in the AbFab style. This painting speaks in the Zen Buddhist tradition that what is important is not on the canvas, subversively advocating Atheism.